Green Heart-Shaped Box, Rose Garden - XA6955 Discounts Apply ! 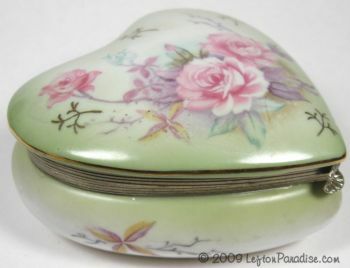 The Rose Garden pattern adorns this pale green trinket box. Heart-shaped with hinged lid and gold trim. Flawless, it measures 4¼ inches wide and is marked XA6955.